So, what does the publisher of a luxury lifestyle magazine do to commemorate a decade of storytelling? 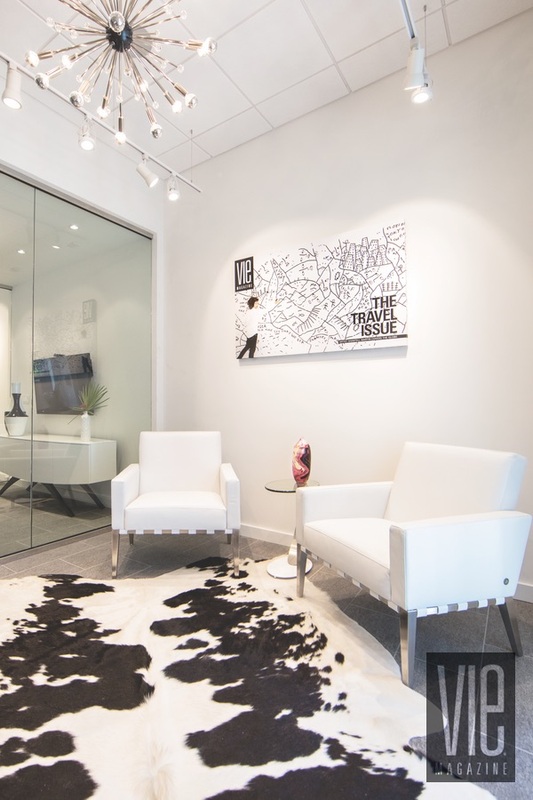 In the case of The Idea Boutique®—publisher of VIE it has to be something spectacular. In the true pioneering spirit of the company’s owner, that celebration embodies increased publication frequency (from bimonthly to monthly), expanded distribution, and a national six-city Stories with Heart and Soul tour to Birmingham, New Orleans, Charleston, Nashville, Boston, and Miami in order to grow the regional magazine to national status. And, to celebrate the milestone in style, VIE christens a new office that reflects the brand and fosters enhanced team creativity. Owner/founder Lisa Burwell opened The Idea Boutique in 1994 as a brand and marketing firm in 1994. With the launch of VIE magazine in 2008, the company entered the world of niche publishing, and Lisa added the moniker of editor-in-chief to her résumé. VIE is now in its tenth year—no small feat considering the vast majority of magazines do not make it past their first year of publication and the economic collapse of a decade ago left dozens of well-established titles fallen sadly by the wayside. As part of the ten-year celebration, Lisa believed that the magazine needed a space to reflect not only the company’s core values, culture, and mores, but also VIE’s clean and creative look. Almost ten years had passed since the company’s last expansion, and it was key that the planning and design of the new space be contemporary to the latest technology and standards of corporate culture. 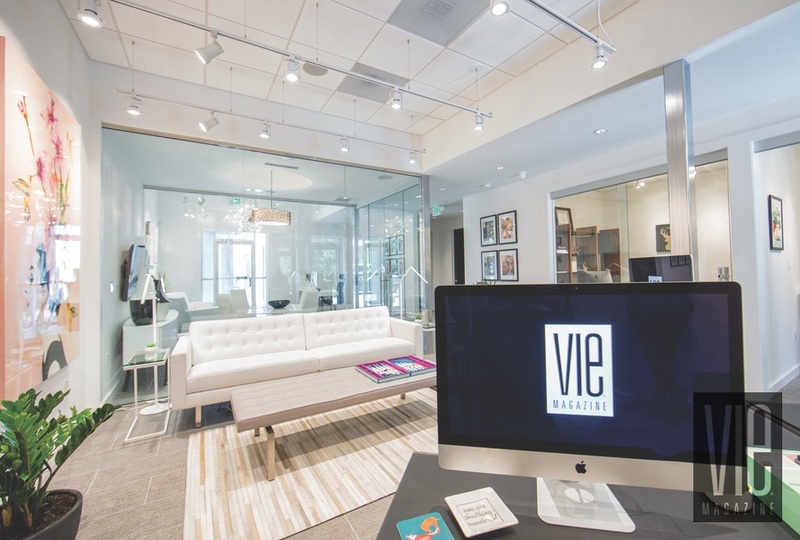 When the tenant space adjacent to The Idea Boutique’s Florida office became available in early 2016, it seemed perfect timing to secure the space for VIE’s future headquarters. Lisa’s husband and business partner, Gerald Burwell, is also the founder and principal of Grayton Beach–based Burwell Associates, Inc.—a full-service architecture company that specializes in high-end residential and highly customized commercial design. Playing an integral role as a company leader and having designed The Idea Boutique’s first international office in Connemara, Ireland, just three years prior, Gerald was ideal in helping to bring the new vision to life. One of the initial inspirations for the new open-plan office came from the movie The Intern, starring Ann Hathaway and Robert De Niro. “I loved the look and feel of the open and modern hipster office,” says Lisa. “I wanted to take cues from the design acumen.” Filmed in a photo studio in the Bronx, New York, the set design for the large, modern, and open space of the make-believe start-up e-commerce company in the story line was modeled from numerous real-life businesses such as Google and Nasty Gal. “My job was to apply this office concept, which is utilized by large firms, and adapt it to our small and intimate company, which has a staff of less than fifteen,” adds Gerald. The whimsy of a magnificent Ashley Longshore is an appropriate juxtaposition to the clean and simple lines in the lounge area. When it came to choosing a contractor, Gerald looked to Richard Abel with Kevrick Construction, LLC. “Richard was the project electrician for our office expansion ten years prior, so I knew that he could be counted on to do a great job,” says Gerald. A construction project never comes without its challenges, but the clean, precise lines and details took this to a higher level. “With an architect as a client, I knew there would be exacting standards and high expectations when it came to execution,” says Richard. Due to the simplified yet acute nature of modern architecture, the overall aesthetic of the design relies on the proper execution of several things. The quality of that execution is key to the success of any construction project. The resulting product is a testament to the dedication and hard work put forth by Kevrick. One of the most important design elements of the new VIE office are the chrome columns. “Designing a nine-foot six-inch-by-six-inch structural steel column is a pretty simple thing to do,” says Gerald. “What did not come easily was finding a source to chrome plate a column of that size.” Gerald believes that it was more than luck that he found Smith Chrome Plating of Montgomery, Alabama—the only plating service that could be found in the entire Southeast capable of chrome plating anything longer than seven feet. Contractors Steel Supply, Inc., also of Montgomery, fabricated the steel columns and coordinated delivery to Smith Chrome Plating twenty miles across town. “Though the chrome columns act almost purely in an aesthetic capacity, the money, time, and effort to get them was well worth it,” adds Gerald. The Idea Boutique’s publishing, marketing, and advertising office in picturesque Clifden, County Galway, Ireland, was also designed by Gerald Burwell of Burwell Associates, Inc.
A project of this kind is not finished simply because the hammers and paintbrushes come to rest. A raw architectural space means nothing without relating to mankind. And, in this case, as is with most architecture projects, furniture is that bridge between man and his environment. Gerald worked closely with Todd D. Reeves, co-owner of Isidro Dunbar Modern Interiors, to bring VIE’s new space to life. “I enjoyed working with Todd, who understood my vision, and he selected furnishings with finishes and materials that built upon the established vernacular,” Gerald relates. Though Lisa is obviously a proud wife, she is a huge fan of Gerald’s design prowess and is always impressed with his craftsmanship and eye for detail. “What amazes me about both the satellite office in Ireland and the new VIE office is that they are a testament to his ability to make small spaces feel roomy,” says Lisa. VIE: Tell us a little about idMI, your background, and your company’s mission. Todd D. Reeves: The company was founded in October 1993, in Topeka, Kansas. I had previously been in women’s couture fashion for fifteen years in New York, where Jorge worked in advertising. We relocated to Topeka for family reasons and opened the store because there was not one store in the area that we would shop in. 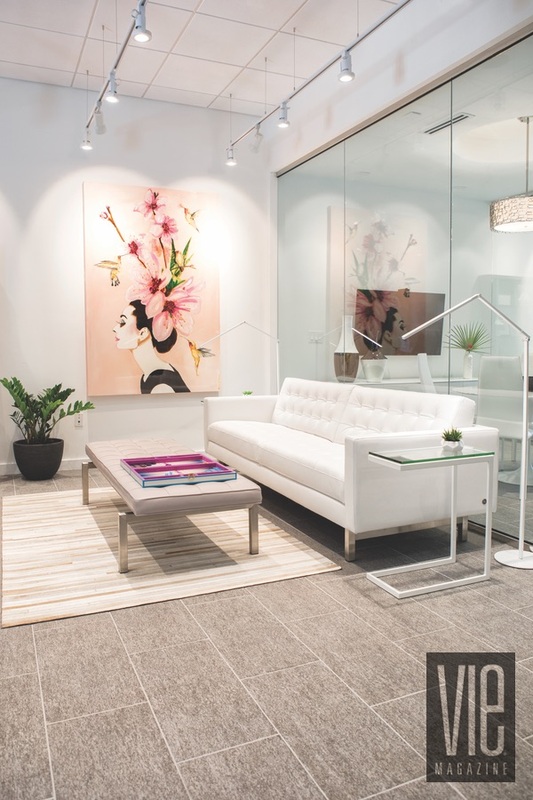 The mission of isidro dunbar Modern Interiors has always been to provide our customers and interior design clients simply the best in modern home accessories, artwork, furniture, lighting, rugs, and more. We provide “fashion for the home.” We have been in business for twenty-four years and are very proud of our store and our design work. We have done modern and only modern design for those twenty-four years, separating us from the pack. Wouldn’t you rather shop with someone who has the knowledge of the modern design world than someone that has just put a modern section in their business? 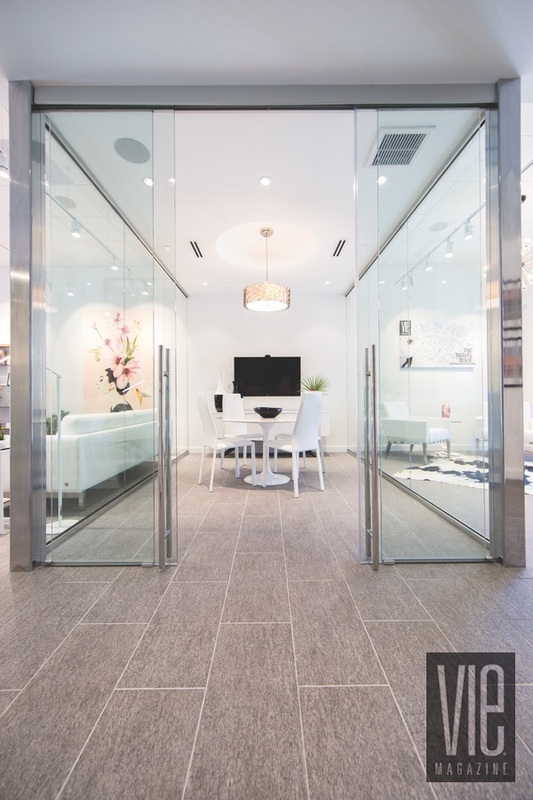 VIE: Have you designed many offices or do you typically work with residential clients? TDR: We have done everything from a community civic theater to offices for ad agencies, insurance companies, private medical teams, and even entire renovations for call and training centers in Independence, Missouri, and Chattanooga, Tennessee. And now, we have gotten to do the VIE office! We offer modern furnishings for both residential and commercial use and do a great deal of residential interior design, as well. We enjoy designing for and working closely with our clients to create spaces they love. We are not a cookie-cutter interior design firm; we are specific to each customer and his or her unique style. VIE: What was the inspiration behind the VIE office decor? TDR: After meeting with Lisa, we knew the direction she wanted to go when decorating the new office, and it was what our store is all about—modern, clean, stylish, and sophisticated. We then sat down with Gerald to cover the specifics in the space and we “talked the office through.” He left me with architectural plans, and we pulled a presentation together for him to see and hit it right on the target. This happens a great deal when you listen to people and talk about what they want to achieve in their spaces. The inspiration is VIE magazine and Lisa and Gerald Burwell’s dreams and goals for the future direction of the publication. VIE: How would you describe this project? TDR: This office represents VIE; it doesn’t clutter your brain with anything else. You know you have entered the headquarters of VIE magazine when you come in the door. That is how we design spaces to reflect the client. It represents what the magazine is doing with fashion, stories, outreach, and community. Allowing the employees to have clear heads without too much “stuff” in the way promotes focus on their work and creativity. It is also a beautiful place to show various products that isidro dunbar Modern Interiors represents in the store and in our design work. The furniture is clean and simple, the artwork stands out, the space is not crowded with clutter, and the environment is stylish, which is just one of the directions of VIE magazine. VIE: What is your favorite feature of the VIE office? TDR: I love the glassed-in conference room and offices off the “design pit” studio area, and the entry is clean, crisp, stylish, and sophisticated. I had an enjoyable time working with Lisa and Gerald; they have discovered a new calmness that isidro dunbar Modern Interiors can provide. Less is more and simple is best—things really mean something in a clean space. I love it all! VIE: How can new clients reach you or learn more about idMI? TDR: Our retail showroom is located in the Florida Panhandle along the Emerald Coast at 12170 Emerald Coast Parkway in Miramar Beach and our website is idmidesign.com. We can also be reached by phone at (850) 269-1699 or e-mail at idmi@idmidesign.com.